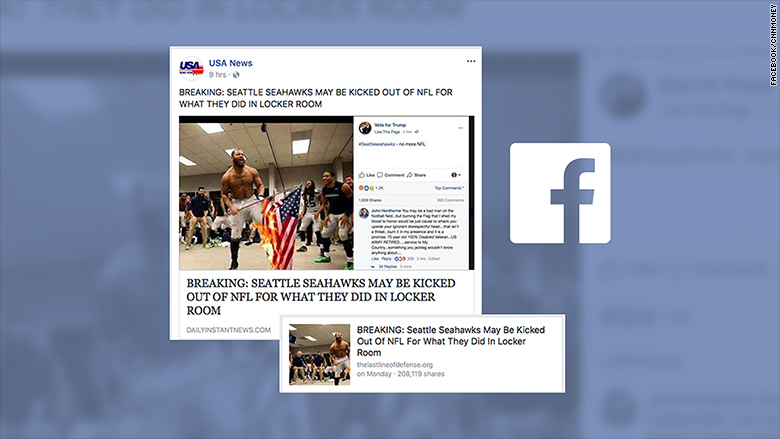 Last week, right-wing social media platforms widely shared a fake news story about an NFL player supposedly burning an American flag in the team's locker room. The story was thoroughly debunked by a number of media outlets. Yet, nearly a week later, it was still being circulated on Facebook, underscoring how fake news can flourish on the social media platform even after such stories have been disproved. This particular fake news story was based on an image photoshopped to show Seattle Seahawks defensive end Michael Bennett burning a US flag while teammates and head coach Pete Carroll cheered on in the locker room. The incorrect article, manufactured after President Trump spent a weekend demanding the NFL fire athletes who refused to stand for the national anthem, said the team "may be kicked out of the NFL" for the behavior -- a complete fabrication. Yet despite it being entirely false, and debunked last week, Facebook failed to prevent it from spreading on its platform. One version of the story, posted on Monday, was shared more than 200,000 times, according to Facebook's own analytics. That particular version of the story had apparently gained so much traction on the platform that when users searched for "Seahawks locker room," the top result was a link to a site hosting a copy of the fake story. Similar posts based on the photoshopped image racked up thousands of shares throughout the week. Reached for comment on Thursday, a Facebook spokesperson told CNN it had taken swift action against two pages which appeared largely responsible for spreading the fake story. One was called USA News and had nearly 100,000 followers. It seemed to exclusively post links to DailyInstantNews.com, a website whose domain was registered in a Macedonian town notorious for manufacturing fake news. The other page, 24FoxNews, unrelated to Fox News, had nearly 70,000 fans and linked frequently to PoliticNewsUSA.com, a website that published fake news, but whose registration information was private. "Among others this week, we have removed the USA News and 24FoxNews Pages for violating our policies," the Facebook spokesperson told CNN. "All posts that have been re-shared from the Pages we unpublished will also be removed (as a result of the Page being taken down)." The Facebook spokesperson added, "In Facebook Search, we are increasing the emphasis we put on signals that reveal a certain level of quality, such as clickbait or low quality ads experiences that we recently announced on the News Feed FYI blog. This will improve the quality of our search results for people looking to find information on Facebook." It is noteworthy the action from Facebook only came after CNN reached out to the company for comment. Left to its own devices, it's possible -- even perhaps likely -- the fake story would have continued to circulate unchecked. Which raises an interesting question: Is Facebook's reliance on an algorithm enough to combat misinformation that spreads on the site? Facebook has moved away from human editors and chosen to empower its algorithm. In the summer of 2016, it fired a team of people who were responsible for curating its Trending topics list. A team of human editors could have helped curtail such fake news on the social network. Real people can monitor Facebook for popular fake news stories and promptly remove them. If such a team were employed, it's hard to imagine this particular story would have flown under the radar, considering the attention the photo received last week. Instead, Facebook's reliance on an algorithm left it blind, in this case, to the fact that an obviously fake story was continuing to find a haven on its platform days after it had been easily disproved. This is not the first time Facebook's algorithm has failed to thwart fake news. Earlier this week, the algorithm surfaced stories from dubious news sources on its Crisis Response page following the Las Vegas shooting massacre. Among the outlets promoted by Facebook were The Gateway Pundit; a blog called Alt Right News; and several websites of questionable credibility. The posts were removed, once again, after people from news outlets sought comment from Facebook on the promotion of such websites. None of this is to say Facebook isn't looking for solutions in its fight with fake news. The company has explored a number of options to prevent falsehoods from being disseminated on the social network. Facebook announced on Thursday it was testing a new feature to give users context about the articles they share. Such context would include information about the publisher and related stories. The boosting of misinformation comes at a bad time for Facebook. The company is facing questions about the possible role it may have inadvertently played in Russia's campaign to influence the 2016 election. On Monday, Facebook turned over to Congress 3,000 ads linked to a Russian troll farm.